Derby’s new ace mod club Bert’s Apple Crumble gets set to relaunch in a new improved venue. The monthly Midlands club, hosted by Craig Simpson and Dom Cater and featuring regular guest spots, will continue to bring the best in funk, soul, ska, and 60s club sounds at a brand new venue The Royal on Victoria Street from Friday 23rd of May. The club will then run every 4th Friday from them on. The new venue will allow the club to open for longer (10pm-3.30am), and all for just £3 before midnight or £5 after. 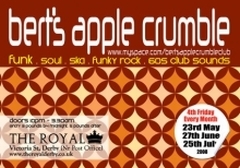 For more on the club, and to keep updated on future guest DJs, see the Bert’s Apple Crumble Myspace page here.